Recently we have had some users complaining about their default printer changing in Windows Vista. They would set their default printer, then everything would be fine for a while, but once in a while the default printer would change, or there would be no default printer set anymore. There was no apparent reason for this to be happening and we couldn’t really identify why the default printer was changing, but we now have a solution. It seems this particular problem was being caused by the remote desktop connection. 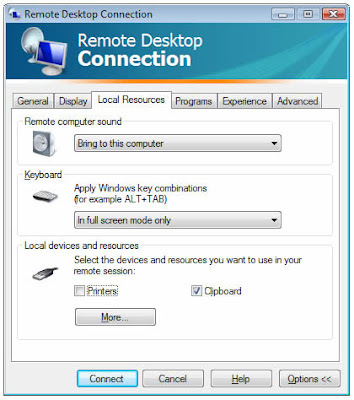 If a user connects remotely to their Vista PC and has the local printers option set (under the Local Devices and Resources tab), this causes the default printer on the Vista PC to change. See the screenshot below. So if your default Vista printer has been changing and you use remote desktop, try the above and the problem should go away. However, don’t do this if you actually do want to use local printers in your remote session.